To mark the end of the 2018 Purple Hibiscus Trust Creative Writing Workshop, celebrated author and novelist, Chimamanda Ngozi Adichie, treated her students, family and fans to a literary evening on Friday, November 30, 2019, at the Oriental Hotel, Lagos. The event was organised in partnership with Trace TV and Venator Partners Ltd. Expressing her appreciation to her guest writers, workshop participants and partners, the writer said, “It’s been really heart-warming to watch them evolve in just 10 days. There’s nothing more humanising, and there’s nothing more stereotype-challenging than to meet actual people from parts of the country that you don’t really know very much about. Sam Onyemelukwe, Managing Director of Trace TV and Venator Partners Ltd, stated that the organisation was very pleased to partner with Adichie for changing the narratives about Nigeria and Africa in the mainstream media, as well as the stereotypes associated with women and writing as a profession. He added that Trace’s core mission to entertain, enlighten, and educate youths, informed their partnership with the writer. Hosted by Ozzy Agu and Oreka Godis, the evening featured panellists –American novelist, David Eggers, Lola Shoneyin and Dr Eghosa Imasuen –all of whom were coaches at the workshop. 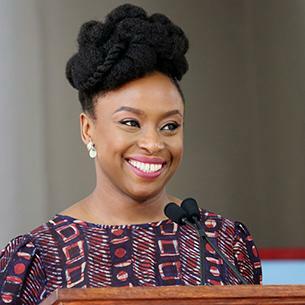 The graduating class were awarded certificates, with Chimamanda Adichie sharing her personal experiences at the workshop with each of them. Also present at the event were Chimamanda’s husband, Ivara Esege; her mother, Mrs Grace Ifeoma Adichie; among and sister. Rappers, Phyno and Zoro, also gave exciting performances at the event. Previously called The Farafina Trust, the Purple Hibiscus Trust Creative Writing Workshop has spanned a decade, producing over 200 alumni, many of whom have become published writers and editors. Some of the notable ones include Yewande Omotoso, South African based writer, whose work was nominated for the Bailey’s Women’s Prize for Fiction in 2017 and shortlisted for the 2018 International Dublin Literary Award; Mona Opubor, the editor of Lost in Lagos magazine; Chika Oduah, Nigerian-American journalist, who was awarded a CNN Multichoice African Journalist Award in 2016, among others.